WMS stands for Warehouse Management System. At WiSys, we look at WMS as a suite of products and processes that enable the warehouse workers to update SAP Business One and Macola in real-time starting at the first touch-point in the organization. Anytime a warehouse worker physically moves inventory on the warehouse floor, a Warehouse Management System is updating SAP Business One and Macola in real-time. By doing this, a WMS can help you organize your inventory in the warehouse and accurately keep track of it. The short answer is everyone with inventory that is moving through a warehouse needs WMS to effectively track where inventory is and be sure information is up to date and accurate at all times. A Warehouse Management Systems allows you to manage inventory effectively to handle increasing volumes of shipments so your inventory is not sitting still. You are able to move inventory and handle volume as business increases. PO receiving is an easy place to start. You can get inventory in the door, instantly received against a PO and print your own barcode at the same time. Once inventory is in the system, you know exactly how much you have and where to find it for use later in order picking, production and shipping. 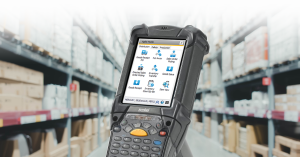 A WMS uses barcode scanning to update and track your inventory in real-time. This eliminates the need to manually write information down and key it into the system later. Because a WMS is tracking your inventory at all times, you can be sure the computer inventory always matches what’s really in the warehouse and you are able to handle faster cycle counting or mitigate the need to count altogether. Many WMS users go from counting once per week to once per quarter because they feel confident enough in their counts. Customer satisfaction and retention is one of the most important parts of being profitable as a business. By using barcode scanning, a Warehouse Management System reduces errors and allows you to validate that customers are getting the right items in their order. You can be sure you are shipping the right product to your customers and keep them updated about where their product is in the cycle at all times. Do your customers have compliance requirements? A WMS also allows you to print barcoded labels based upon customer shipping requirements, making compliance easier. This accuracy and flexibility creates better customer service and loyal customers.